Formed in the late 1920's and early 1930's by its leader, Konstantin Heirl, for the purpose of eliminating the mass unemployment existing among the youth of Germany. Every young German male was required to serve a period of six months in the RAD prior to joining the Army. The men lived in camps and were trained in drill, marching, and digging, but were not armed. The organisation may be compared to the U.S. Civilian Conservation Corp (CCC) Program instituted in this country at the same time to combat the unemployment problem. By 1939 the RAD had 360,000 men in service that were organised and administered by a small number of permanent full time staff. With the onset of war in 1939, the RAD members were given military training and subsequently, transferred directly into the Nazi Armed Forces. During the war, RAD members were called upon to level roads and airfields, clear away rubble, repair damaged railways, collect captured war material, and generally perform manual labour in the occupied territories. In 1943 the RAD was armed and militarised and operating through out occupied territories. To show how important the RAD became to the war effort, Adolph Hitler awarded the German Order to Konstantin Heirl, the second recipient of Germanys highest award. The RAD Leaders Hewer was issued for wear to permanent officers of the rank of Feldmeister or above in December 1937. The Hewer was designed by Paul Casburg and was more dagger like that the RAD EM Hewer in its being very light weight. 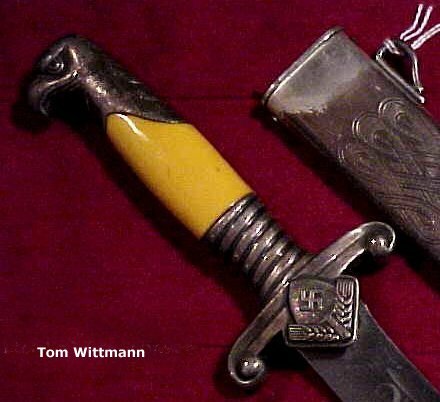 The Hilt took the form of a stylised eagles head pommel and was made of a low-grade aluminium. The grip plates were plastic and are found in white 95% of the time, orange grip plates are very seldom encountered but when they are its 99.99% of the time found on a R.H. Herder or WKC made daggers. Real ivory grip plates were also offered and are extremely rare to find I have only found one dagger with them in over 40 years. The cross guard had the RAD organisation spade emblem at its centre the hilt should not be confused with more than one part as the hilt is one piece. There is an area at the centre base of the crossguard where the blades tang inserts into the hilt where there is a bar with a hole drilled to slip the grip screw through to hold the hilt together. 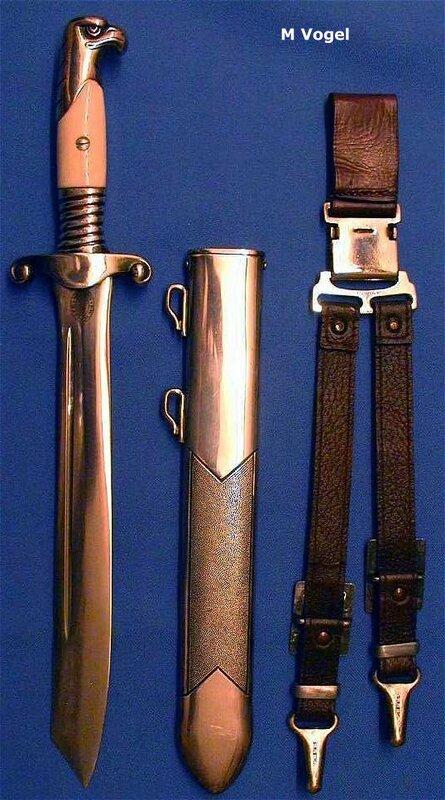 The hilt has an anodised silver finish that can range from bright silver to a dull silver look. The recessed areas have a dark burnish polish added then a clear lacquer finish. Very late made WKC daggers I have observed had NO anodised finish and were just polished aluminium with the burnishing and clear lacquer. 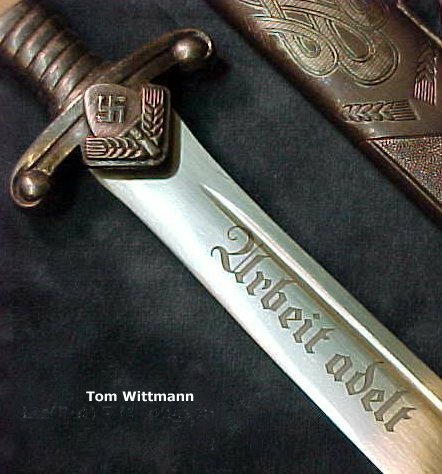 The blade was similar to the RAD EM Hewer and had the same motto engraved onto the blade. The blade also had a fuller, which ran ¾ of the blades length. This smaller blade is made of a hollow ground carbon steel with a dull buffed finish, crossgrain is hardly ever found on this style blade. It’s also about 1/3 the weight of the early pattern. A few of these have shown up on the market with an artificial damast blade in a small rosebud configuration, made by Eickhorn and C.J. Krebs. These damast blade leader daggers are very rare. 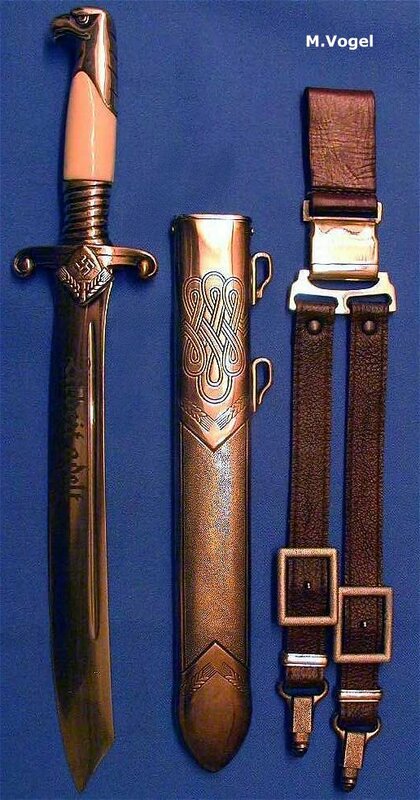 The scabbard body is made of a low-grade lightweight steel and then silver-plated with 2-3 microns of silver plate. On some the pebbled area can be found with a blued finish in the backgrounds like the example made by C.J. Krebs and Eickhorn. The wheat designs on some scabbards will have the burnished backgrounds. The throat is held in with side mount screws, these will vary from maker to maker. Attached to the throat are the standard runners found on most all daggers from the period, they are attached like a SA style with a single rivet per runner. The hanger was of dual strap design, made of brown leather with square aluminium buckles and all other fittings. Some fittings have a pebbled finish and some are smooth. 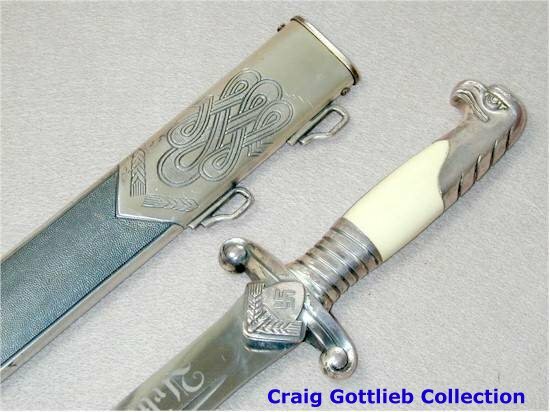 The Hewer could be purchased by the relevant officers, a few of whom had it engraved with their initials, but this is very rare indeed to find personalised daggers. No Portapee was worn with the Hewer. Production was discontinued in 1942.